Koch is also reaping the benefits from Dodd-Frank’s impacts on Wall Street. The so-called Volcker Rule, implemented at the end of last year, bans investment banks from “proprietary trading” – investing on their own behalf in securities and derivatives. As a result, many Wall Street banks are unloading their commodities-trading units. But Volcker does not apply to nonbank traders like Koch. They’re now able to pick up clients who might previously have traded with JPMorgan. In its marketing materials for its trading operations, Koch boasts to potential clients that it can provide “physical and financial market liquidity at times when others pull back.” Koch also likely benefits from loopholes that exempt the company from posting collateral for derivatives trades and allow it to continue trading swaps without posting the transactions to a transparent electronic exchange. Though competitors like BP and Cargill have registered with the CFTC as swaps dealers – subjecting their trades to tightened regulation – Koch conspicuously has not. So, basically, Koch can now do to the nation’s and the world’s commodities markets what it has done to our air and water. And Congress, its morals and environmental concerns lubed by tens of millions in Koch lobbying money, is letting the company go right ahead and do that. And it will do it; the company’s regulatory and criminal record is one of almost unrelieved violations, punctuated only by fines that, while perhaps big in historical terms, are no more than a minor annoyance to the company’s balance sheet. More than enough evidence exists to level a RICO charge against CEO Charles Koch. That a massive company with such a troubling record as Koch Industries remains unfettered by financial regulation should strike fear in the heart of anyone with a stake in the health of the American economy. Though Koch has cultivated a reputation as an economically conservative company, it has long flirted with danger. And that it has not suffered a catastrophic loss in the past 15 years would seem to be as much about luck as about skillful management. But in the real world, Koch Industries has used its political might to beat back the very market-based mechanisms – including a cap-and-trade market for carbon pollution – needed to create the ownership rights for pollution that Charles says would improve the functioning of capitalism. In fact, it appears the very essence of the Koch business model is to exploit breakdowns in the free market. Koch has profited precisely by dumping billions of pounds of pollutants into our waters and skies – essentially for free. It racks up enormous profits from speculative trades lacking economic value that drive up costs for consumers and create risks for our economy. That is a business model for whose banning we have more than sufficient justification. Koch Industries is the industrial and financial equivalent of a serial killer. It has killed many times, and left unimpeded, it is certain to kill again many more times. This adjective [“enormous” — Lex] appeared in a top of the hour news piece (sorry, no link [this NPR blog post uses the adjective “massive” — Lex] referring to the spending bill approved by Congress on Wednesday evening. It would be interesting to know how it made this assessment. While the government spends more money each year than any of its listeners will see in their lifetime, it spends less relative to the size of its economy than almost any other wealthy country. It is also spending less relative to the size of the economy than it did in the years 2009-2012. The domestic discretionary portion of the budget, which was close to half of the spending bill, is smaller relative to the size of the economy than it has been in decades. It’s a simple point, but one journalists at even the biggest outlets in the business can’t seem to learn: a number is meaningless — or, worse, misleading — absent context. I bolded the last part because although I want to shout this in all upper-case letters, I have chosen merely to emphasize it instead. Comments Off on You keep using that word. It does not mean what you think it means. … did you know, despite this fact being absent both from Michael Moore’s ultra-liberal documentary and ten thousand mainstream media accounts of GM’s bankruptcy a few years ago, that the financial collapse of what was once the world’s largest corporation was precipitated by Roger Smith’s bright idea to replace all of the autoworkers with robots? True story. General Motors under Smith spent $90 billion on robotics and automation in nine years. Think about that for a second. Ninety billion dollars. $90,000,000,000.00. Of course none of it worked, with factory robots breaking down constantly, painting one another, and welding car doors shut. It’s easy to say that the company got what it deserved and forget about it. But think for a second about the mindset of a group of people so committed to the concept of eliminating the workforce (and the UAW) that it would piss away ninety billion dollars trying to do it. Even if the Worker Bots worked flawlessly, how could that possibly make financial sense? How many decades and centuries of “savings” from lower wages to earn back those sunk costs? And how much money would the Robo-Factories demand in the future for maintenance, upgrades, and eventual replacement with newer and better technology? For $90 billion, GM simply could have purchased Toyota, Honda, Nissan, and most of its other foreign rivals – several times over. Of course, in that scenario they’d still have to pay people to make cars. The fact is that General Motors didn’t go bankrupt, it committed financial suicide because its executive culture fostered a loathing for the UAW and the hourly workforce that was so extreme that it obliterated basic logic and business sense. The idea was not to replace the workers with Japanese robots (GM Robotics was acquired from Fujitsu) because it would save money; it was to replace the workers with robots because [expletive] the workers. Phrased a little less colorfully, that mindset has put us where we are today, with the stock market, corporate profits and corporate cash on hand at all-time highs — not because of greatly increased sales, but mainly because of cost-cutting, primarily by laying people off. Which raises a question I wish would become an integral part of the debate in any campaign for federal office: What is the purpose of the economy? Is it to make a very few individuals and large corporations fantastically wealthy? Or is it to create jobs in which people produce goods or services that other people want to buy? My bias on this question is pretty obvious, but I imagine a large majority of Americans share that bias. If so, then what role should government play and how should it go about playing that role? The GOP response for my adult lifetime has been lower taxes and fewer regulations, which not only has gotten us coming up on six lost years of economic activity but also is injuring, sickening and killing people while poisoning the planet, from Fukushima, Japan, to Charleston, West Virginia. In any event, thanks to Ezra Klein’s invaluable House Of Wonks, we discover that all the howling about The Deficit has obscured the fact that, whatever real problems with the deficit are, they’re actually being slowly solved. This is a good thing to remember since it’s better than 6-5 that almost all the commentary after the president’s speech tonight is going to carry the theme that he didn’t do enough to address The Deficit. Here is something else to remember — given that chart, anyone who still argues for austerity in any form — and this means you, Dancin’ Dave [Gregory, of NBC — Lex] — is doing so because they want government to hurt people, or they don’t give a damn whether it does or not. There’s no third alternative. We don’t need deficit-fixin’. We need hirin’. Lots of it. Now. My friend and fellow blogger Billy Jones has been through a rough few years. He just had an experience most of us who are more comfortable would describe as somewhere between bad and awful. And yet, in a message to me, he calls it a small victory. I’ll let you decide just how small. Why tonight’s debate matters; or, Quote of the Day, What the GOP is Good At Edition, cont. The American right’s real genius lies in [mess]ing things up, then using that [mess]ed-up-ness as the crisis that necessitates the implementation of the right’s policies. I don’t claim that the [mess]ing up of things is always deliberate—they’re incompetent enough to [mess] a lot of things up by accident—but the reaction is very cynical and very carefully thought out. Let’s first imagine that, on January 20, Romney takes the oath of office. Of the many secret post-victory plans floating around in the inner circles of the campaigns, the least secret is Romney’s intention to implement Paul Ryan’s budget. The Ryan budget has come to be almost synonymous with the Republican Party agenda, and Romney has embraced it with only slight variations. It would repeal Obamacare, cut income-tax rates, turn Medicare for people under 55 years old into subsidized private insurance, increase defense spending, and cut domestic spending, with especially large cuts for Medicaid, food stamps, and other programs targeted to the very poor. Few voters understand just how rapidly Romney could achieve this, rewriting the American social compact in one swift stroke. Ryan’s plan has never attracted Democratic support, but it is not designed for bipartisanship. Ryan deliberately built it to circumvent a Senate filibuster, stocking the plan with budget legislation that is allowed, under Senate “budget reconciliation” procedures, to pass with a simple majority. Republicans have been planning the mechanics of the vote for many months, and Republican insiders expect Romney to use reconciliation to pass the bill. Republicans would still need to control 50 votes in the Senate (Ryan, as vice-president, would cast the tiebreaking vote), but if Romney wins the presidency, he’ll likely precipitate a partywide tail wind that would extend to the GOP’s Senate slate. One might suppose that at least a handful of Republicans might blanch at the prospect of reshaping the entire face of government unilaterally. But Ryan’s careful organizing of the party agenda has all taken place with this vote as the end point, and with the clear goal of sidestepping any such objection. When Republicans won control of Congress during the 2010 elections, Ryan successfully lobbied the party to take a vote on his budget plan the following April. The plan stood no chance of passage (given Obama’s certain veto) and exposed dozens of vulnerable House members to withering attacks over its unpopular provisions. So why hold a vote carrying huge potential risk and no chance of immediate success? So Ryan could get the party on record supporting his plan, depriving quiet dissidents of any future excuse to defect should the real vote come in 2013. And if this were only a policy difference, that would be one thing. But the fact of the matter is that if these planned changes happen, a nontrivial number of America’s most vulnerable citizens — the very old, the very young, the chronically ill, those most hampered and hammered by the past four years of insufficient-bordering-on-indifferent action on unemployment — will die prematurely. That’s not hyperbole. That’s not an idle prediction. It is, rather, an absolutely foreseeable consequence of cutting social services, particularly Medicaid, in a time of great need and want. And if you don’t care about that, you’re a sociopath, pure and simple. There are many things at stake in tonight’s debate and this year’s presidential and congressional elections, not the least of which are the fate of the globe’s environment and the fact that both my children will be of military age before the end of a second Romney term. But for a combination of big and fast, the GOP plan to destroy what remains of the social safety net and give the proceeds to the very wealthy tops the list, and it simply cannot be allowed to happen. Comments Off on Why tonight’s debate matters; or, Quote of the Day, What the GOP is Good At Edition, cont. You cannot slash taxes AND slash spending AND still reduce the deficit. It’s mathematically impossible. You can no more reduce the deficit this way than you can walk to the moon or skin-dive the Marianas Trench. And if you try it, we’ll be in another recession in a heartbeat. Hell, with three straight months of falling consumer spending, we might be heading into another one even if you don’t. This really is the era of lowered expectations. I used to pray for deliverance from extremist ideologues. Now I just pray for deliverance from people who can’t count. While this is no doubt true, it is worth mentioning that just about all progressives said at the time that the stimulus would be inadequate to restore the economy to a healthy growth path. The collapse of the housing bubble destroyed close to $1.2 trillion in annual demand from construction and consumption. At its peak in 2009 and 2010 the stimulus only replaced about $300 billion in annual spending. It is discouraging to see so many people suffering unnecessarily, but this outcome is exactly what our analysis predicted at the time. Unfortunately, having a track record of being right is not generally a factor in determining which views carry weight in Washington policy debates. When 95 percent of the American work force has got a secure job that provides enough to covers its needs, provide for occasional wants and leave a little over to be put aside toward its dreams, then I might entertain lectures from our social overlords about the morality of the lower classes. Until then, however, Murray and his ilk need to STFU. The unemployment rate for the 30 percent of the workforce with college degrees is still more than twice its pre-recession level. If the Post had done its homework it would know that the problem is not the skill levels of unemployed workers, the problem is the skill level of people who make economic policy. One reason multi-millionaire investors like Gov. Romney face 15% tax rates is because they engage in corporate activities but avoid corporate taxes. They do so by taking advantage of policy changes that have made it easier to pass capital gains through the corporation to their personal income, where, in the case of PE managers, they tap a double loophole. First, capital gains are taxed at less than half the rate of normal income, and second, even though these gains are really earnings for the fund managers, they get to claim them as capital gains (this is the notorious “carried interest” loophole). Although businesses operating through C corporations [standard corporations] are subject to corporate taxes, the capital income of non-incorporated businesses is “passed through” to the business owners. These owners benefit from the same tax deductions and credits as do corporations, but are taxed only at the individual level. Over the past half century, and particularly during the 1980s and 1990s, states and the federal government significantly expanded the legal benefits of pass-through entities. These changes have made it easier for firms to operate through such legal structures as S corporations, partnerships, limited liability companies, and sole proprietorships — while also benefiting from limited liability and other provisions that formerly were available only to corporations. 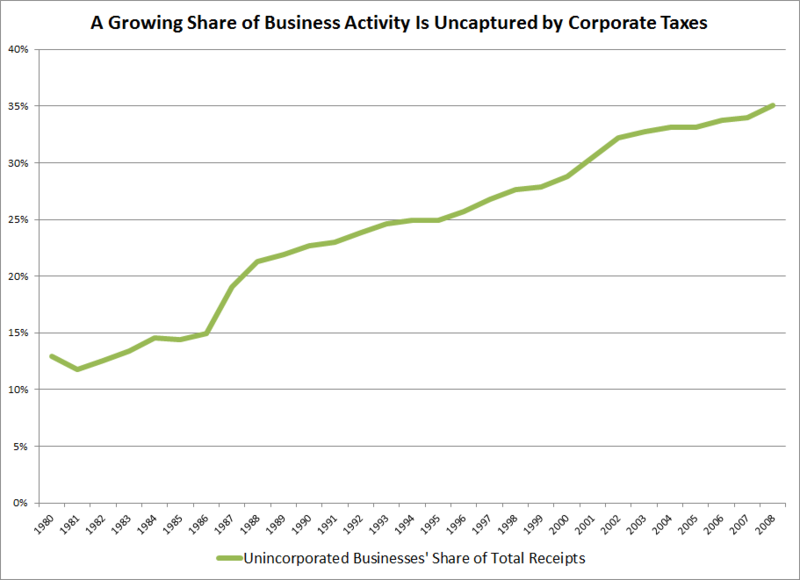 As you see in the figure, the share of receipts passed through to non-incorporated business has almost tripled since 1980s, up from 13% to 35%. Moreover, it’s a good example of what happens when you open up these loopholes. The elasiticities attached to changes in tax rates are wildly exaggerated by conservatives and trickle downers who argue that the slightest increase will end the economy while any decrease will trigger boom times. The evidence belies their view in terms of jobs, investments, and growth. But when it comes to sheltering your income (e.g., passing through corporate income to the personal side to tap loopholes like carried interest), how you structure your investment vehicles, your preference for debt over equity financing (debt financing is very much favored by the tax code)—there you see very significant responses. The question is, as posed above, does any of this add value—real value—to the economy beyond further enriching the rich? It’s not a simple question and the answer is probably less obvious than it sounds. There are unquestionably examples of PE firms that have taken over companies and discovered new efficiencies. But neither is it a coincidence that the ascendency of this type of economic activity and the policies that support it have occurred during a period of sharply increasing inequality, weak job creation, and stagnant incomes for the middle class. And Republicans think we need more of this, not less. And don’t whine at me about “double taxation” (corporations paying income taxes, then investors having to pay taxes on dividends). If there weren’t huge benefits associated with being incorporated, not the least of them being the right to buy politicians without having to go to prison if what you do kills a lot of people, then businesses wouldn’t incorporate.